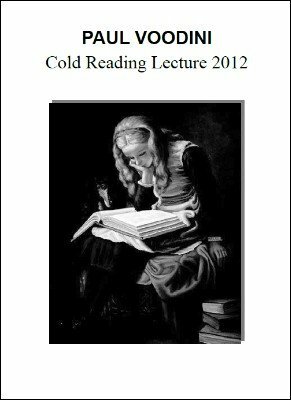 In March of 2012, Paul Voodini was employed to give a 2 hour lecture on cold reading to the drama department of one of England's finest universities. The head of the drama department was perhaps hoping for an explanation of cold reading followed by the usual debunking of psychics as frauds who employ nothing but 'cold reading'. This, however, is not the lecture the university received! While explaining in great detail what cold reading actually is (because, as you'll be aware, there is a lot of misinformation out there), Paul also went on to tackle the subject of genuine intuition. Perhaps controversially, Paul is a believer in intuition and so his lecture ended with a demonstration of this belief in action. This was a fun, up-beat and informative lecture, enjoyed by all. And it was made all the more enjoyable by the fact that it wasn't just another 'cold reading by numbers' talk. Paul has worked as a professional reader for much of his adult life, and this experience shines through in these lecture notes. The lecture notes used on the day have been collated, edited, and are now presented in a 12 page PDF. Bear in mind that this PDF is 12 pages long. There is much here for the beginner and the intermediate reader/mentalist, but there will also be nuggets of information of interest for even the most experienced. And as always, these notes are written in Paul's usual engaging manner. 1st edition 2012, 12 pages.